Kanex simpleDock's 3-in-1 solution provides you with a fast networking experience, iPhone charging, and access to everyday USB devices. Place your smartphone on the dock for convenient charging while staying connected to the host system. simpleDock makes it easy to connect to the devices you use every day. The hidden cable management design keeps your desk organized. Perfect for the home or office, simpleDock makes it easy to connect the peripherals and mobile devices you use every day. Simply plug in your USB hard drive, printer or card reader for an instant connection. For access to a reliable, wired network connection, use the Gigabit Ethernet adapter - all while charging your smartphone. The dedicated charging port delivers 2.1 Amps of power to charge your smartphone and tablet. The innovative design keeps charging USB cables hidden, and serves as a desk valet to keep your smartphone within reach. Connect three peripherals into one working station. The USB 3.0 ports allow super-speed data transfers of up to 5Gbps and are backward compatible with USB 2.0. The simpleDock must be plugged into a USB 3.0 port on the Mac or PC in order to achieve USB 3.0 SuperSpeed rates. 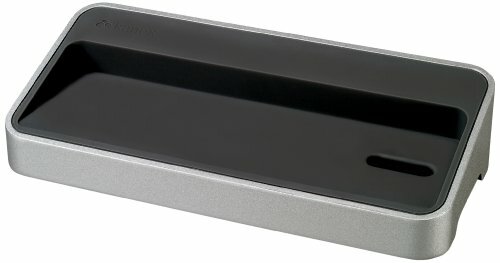 simpleDock's unique, horizontal design takes up minimal space on your desk. 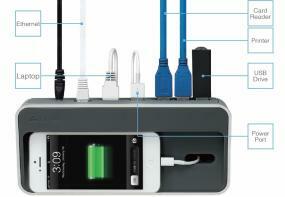 It can charge your smartphone or serve as a desk valet. The zinc alloy material matches perfectly with your MacBook and provides a solid desktop docking station. Named a CES Innovations 2014 Design and Engineering Award Honoree. Kanex simpleDock, 1m USB 3 Micro type B to type A cable, 5V 4A universal power adapter with US/EU/AU/UK prongs, and user guide.